← Essen 2015: A picture is worth a thousand words, right? One of the great things about attending Essen is that with the sheer numbers of games there you can sometimes find a little hidden gem amongst all the buzz of the hot games. On my first walk thru I spied a small box, which immediately piqued my curiosity since you can always find room in the suitcase for a small box, and was excited to discover Tofu Kingdom. 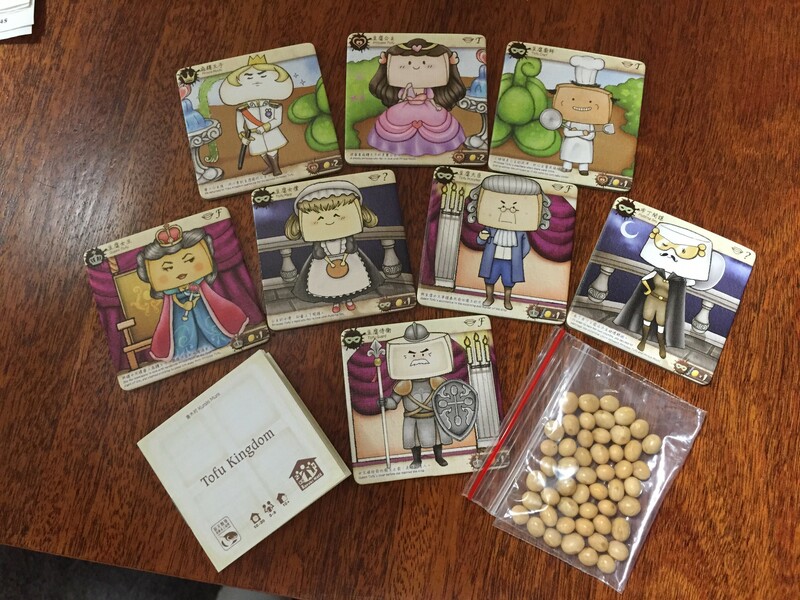 Tofu Kingdom is a small filler for 3-8 players. The game revolves around helping Prince Mochi find his true love Princess Tofu. Of course, Princess Tofu’s evil stepmother Queen Tofu is out to spoil this union. With her assistants Tofu Minister and Tofu Guard, Queen Tofu plots to keep the lovebirds apart. Will Princes Tofu’s allies Tofu Chef and Tofu Maid come to her aid? And who is the mysterious Pudding Spy working for? The game comes with the tale and background for each character and tells what type of food each represents. For example Prince Mochi is Grilled Rice Cake and Princess Tofu is Silken Tofu whereas Queen Tofu is Fried Tofu. If you are familiar with these Asian foods it’s all the more fun. The game actually uses real soybeans as VP counters. The game consist of rounds where one character plays the Prince and closes his eyes while the other players are assigned their characters. The other players then hide their characters and the Prince is allowed to ask each other player one question and one player one additional question. What character does the player represent? What character does another player represent? The trick, of course, is that some characters must tell the truth, some characters must lie, and some characters may tell the truth or lie. After the player with Prince Mochi has asked the questions, they choose which person has Princess Tofu. In the upper left corner of the card is a symbol of a heart, a mask or a crown. Players with characters with matching symbols in the lower right hand earn VP as stated there either from another player or the reserve. The first player to 7 soybeans wins. 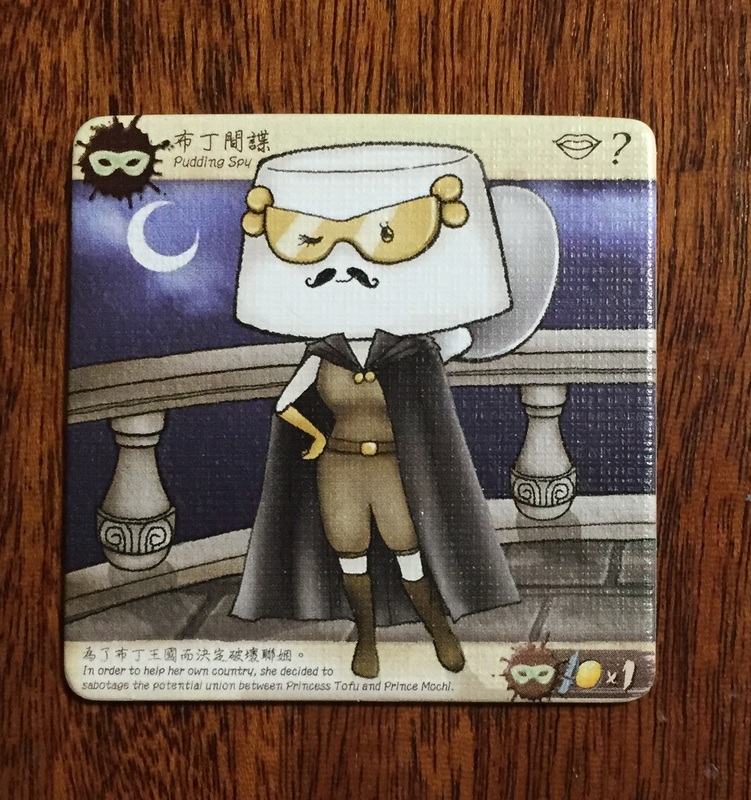 So normally I’m not a fan of bluffing deduction games but Tofu Kingdom has several things going in it’s favor. 1) It’s darn cute. The box art makes the game look like tofu and the little characters are adorable. 2) It’s food themed and I’m a huge fan of Asian food so the characters names are great! 3) I like the fact that only 3 types of questions are allowed and that the number of questions is limited by the number of players. This speeds up the game. 4) Since the VP are dependent on which character is chosen each round the challenge is to try to convince Prince Mochi to choose a character that will get you points not just to choose the Princess or not. 5) It’s a short game and makes a delicious opening or closing filler. This entry was posted in Essen 2015, First Impressions, Uncategorized. Bookmark the permalink. ooh this looks so good. well, so darn cute and tofu themed anyway – soybean VPs! i do love tofu characters and mochi. Do you think this would be similar to Too Many Cinderellas?